Don't you just love surprises? A moment that seemed to be just a regular day, until you get something unexpected, like a brand new Samsung Galaxy Note 5. Who doesn't want one? Korean smartphone manufacturer Samsung, partnered with Uber to launch the Galaxy Note5 Luck 5 on A Ride Promo. The promo where Uber bookings at select locations, entitled passengers instant entry to the contest. Five lucky passengers were given the ride of their lives when Samsung surprised them with the latest Samsung Galaxy Note5 waiting inside their Uber. The goal of the promo was really to give a good surprise, put a smile on winners' faces and make their day. More so, it was an opportunity for the winners to experience getting a cutting-edge smartphone in the most unexpected way. More about the great features of the Samsung Galaxy Note 5 here. Lucky riders. Five lucky Uber riders went home with a Samsung Galaxy Note5, through the Galaxy Note5 Lucky 5 on A Ride Promo, a partnership between innovation leader and Uber. Stephanie Sy, Marketing Manager for Uber Manila, poses with Samsung Galaxy Note 5 winners (from left to right )Katrina Romualdez, Diana Ecija, Justin Poniente and Fe Reyes. Joining them is Patty Rodriguez, Product Manager Head for Samsung Electronics Philippines (rightmost). 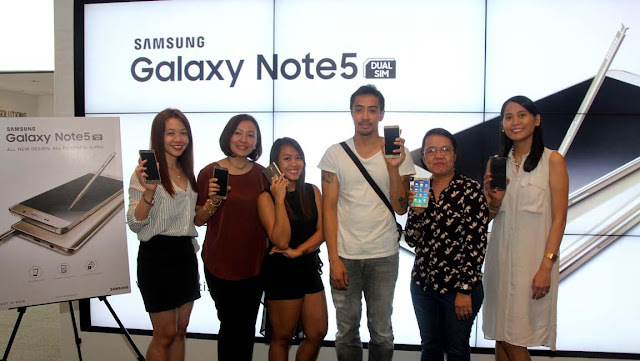 For these lucky individuals, it came as a surprise that on their booked Uber ride, they would come home with the latest Samsung Galaxy Note5. Without their knowledge, their booking made them instant participants of the Galaxy Note5 Luck 5 on A Ride Promo, where five lucky Uber riders were selected when he or she booked a car at select locations. It was truly a matter of being at the right place at the right time. “We at Samsung like surprising people with possibilities that they never thought existed—like getting a cutting-edge smartphone in the most unexpected way. Through this promo with Uber, we hope to open people’s eyes to infinite possibilities out there, which they will also discover once they get their hands on the Galaxy Note5,” said Patty Rodriguez, Samsung Product Marketing Head.